In February 2001, Aussie rock legend Ted Mulry revealed he was suffering brain cancer. He passed away on September 1 2001, just one day short of his 50th birthday. 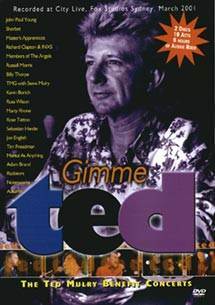 This two disc set features the concerts held in commemoration of his career in March 2001 at Fox studios in Sydney. Showcased are lived performances from Billy Thorpe, The Angels, Rose Tatoo, INXS and many others.